Following on from their recent publication of a chart to help advertisers understand the best ad option for their brand objective/s, LinkedIn has published a new paid media worksheet designed to help guide businesses through the targeting process. 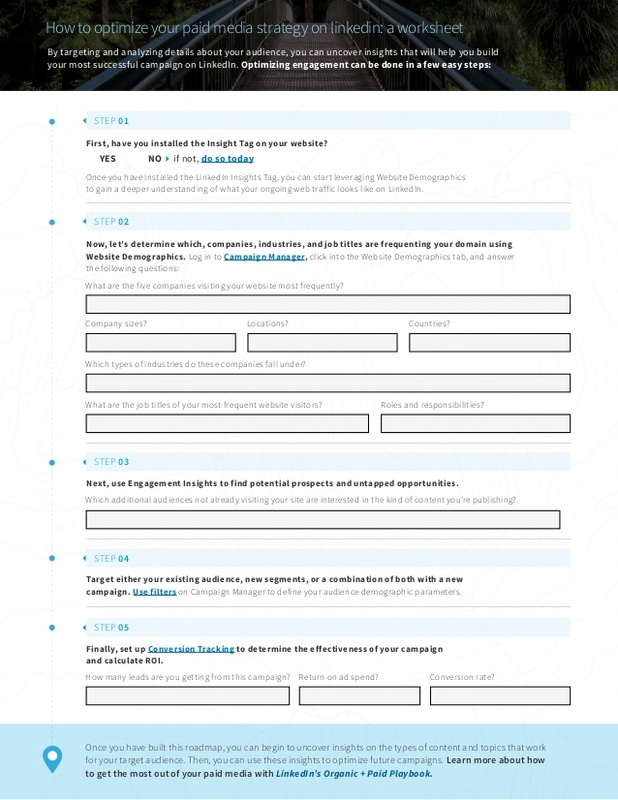 The worksheet outlines how to use LinkedIn's insights tag to help determine the right audience for your campaigns, via the platform's Campaign Manager tool. "Through Campaign Manager, your business has access to a wealth of useful information. For example, you can use the LinkedIn Insight Tag and Website Demographics feature to understand the groups of people who most frequently visit your website domain, revealing percentage breakdowns of top company sizes, locations, industries, job functions, job titles, and more." The worksheet is fairly straightforward, but it's actually fairly detailed in its use of LinkedIn's more complex audience targeting options. Not everyone will need it, but it's definitely worth taking a look - you can check out the full worksheet below.